Our delicious dairy-free basil pesto is rich in nutrients thanks to its artisan recipe. DOP* certified. 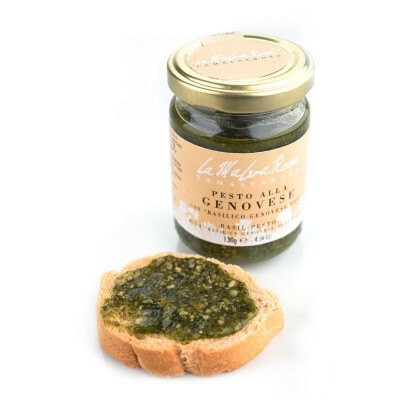 The complex selection behind each ingredient is the key to pesto's great taste and only Italy does it properly. Here, the basil used is DOP certified, cultivated in the producer La Malva Rosa's own land. Also, thanks to an exclusive recipe, they are the only producer to make a pesto without cooking the basil. This means that it tastes much more fresh and doesn't lose any of its minerals or extensive health benefits. It has a shelf-life of 24 months and it does not contain preservatives. Try it with linguine pasta (although almost any pasta shape will do), or use it to enrich your soup, salads or potatoes. It's even ideal with cherry tomatoes and mozzarella to prepare an Italian caprese. *DOP: DOP is short for Denominazione di Origine Protetta (literally “Protected Designation of Origin”). This certification ensures that products are locally grown and packaged, using traditional method. Olive oil, cashews, “basilico Genovese” DOP (basil) (22%), sea salt,pine nuts. PEANUTS, NUTS.